Bundled together by B&H for your convenience, the Behringer XENYX QX1002USB Kit combines a 10-channel USB interface with other items to make podcasting easier for two people. The XENYX QX1002USB interface has two preamps and four stereo line inputs. It connects to your computer over USB. The Samson Q2U Podcasting Pack comes with two dynamic microphones that work over USB or XLR. Both kinds of cables are offered, so you have options. Two tripod stands, mic clips, foam windscreens, and two spring-loaded suspension arms are also provided. To keep all the cables organized, a set of hook-and-loop fasteners are included with this kit. The Behringer XENYX QX1002USB is a mixer that offers clear and natural sound in a compact and portable format. With ten inputs, two high-quality XENYX mic preamps, a multi-FX processor with legendary Klark Teknik reverb, and a USB interface, this versatile mixer is ideal for a wide variety of mix and recording applications, from small-stage gigs to home-studios, mid-size corporate events, and more. The XENYX QX1002USB is quick to set up and operate with all connections and controls easily reachable on the top of the unit. The first two input channels feature XENYX mic preamps, which deliver 130 dB of dynamic range, low-distortion signals, and a wide frequency response extending from 10 Hz to 200 kHz. Switchable 48V phantom power allows you to plug in both dynamic and studio-grade condenser microphones. These channels also offer two 1/4" inputs for line-level signals. Each mono channel features a British-style, 3-band EQ to provide warm and musical tone corrections for your vocals and instruments, as well as an easy-to-use, "one-knob" compressor to gently smooth out signal peaks for punchy and present bass lines, drums, and vocals that sit right in the mix. Gain knobs let you adjust the input levels and clip LEDs alert you when the signal is too high and about to distort. The four sets of stereo inputs feature +4/-10 switches used to match the mixer's input sensitivity to the incoming signal. This helps avoid signal degradation when connecting stereo keyboards or playback devices to the mixer. Pan (or balance) and level controls are included for all channels. To add depth and dimension to your mix, the built-in, Klark Teknik 24-bit multi-FX processor offers 100 presets including reverb, chorus, flanger, delay, pitch-shifter, and a variety of multi-effects. Each channel is equipped with a post-fader FX send, which you can use to send signal to the onboard FX processor or to an external processor. The FX-to-Main knob allows you to control the level of the effect in your main mix. 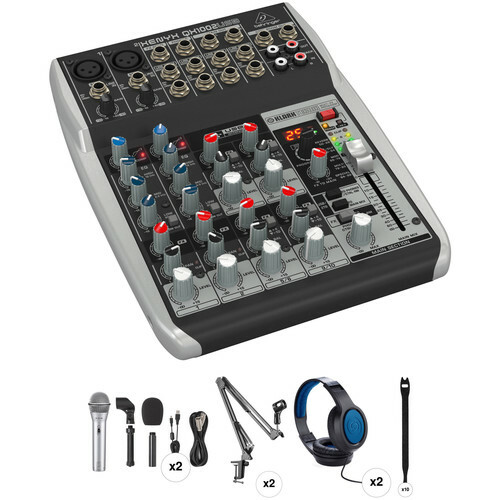 There is also a built-in, stereo USB audio interface for recording your mix directly to a computer. It even comes with the recording and editing software needed to turn your computer system into a complete home recording studio. The 2-Track section provides an easy way to connect an external 2-track recorder and/or playback device. The 2-Track inputs are assignable to either the main mix or to the control room/phone outputs. The main mix fader controls the signal at both the main outs and 2-Track output, while a dedicated knob adjusts the volume for the phone/control room outputs. The silver Samson Q2U Recording & Podcasting Pack includes a USB/XLR handheld dynamic microphone, a desktop tripod stand with extension tube, a mic clip, foam windscreen, USB cable, and an XLR mic cable. The Q2U Recording Pack is a cost-effective solution for the stage, rehearsal studios, and project recording applications. The microphone features both XLR and USB outputs that enable flexible digital recording to any Mac or Windows based computer workstation, while simultaneously connected to any analog mixer, preamplifier or PA system. An on/off switch controls the signal at the XLR output, and its cardioid polar pattern eliminates noise and feedback at the off-axis sections of the capsule. The Q2U Recording & Podcasting Pack delivers clear audio quality with a wide frequency response and digital resolution up to 16-bit/48 kHz. The microphone is completely plug-and-play, and there are no drivers to load. The MCrane1 Microphone Suspension Crane Arm from Musicians Value is a spring-loaded suspension arm that can support a microphone with a shockmount/holder, and a microphone pop filter. The MCrane1 arm can be used in several environments for voice-over, podcast, and radio or DJ applications. A desk-mount clamp is included that allows the arm to swivel for smooth and precise positioning. In addition, it is forward and backward adjustable and height adjustable. Styled in a blue color specifically issued for B&H, the Samson SR350 Over-Ear Stereo Headphones are circumaural, closed-back dynamic headphones with 35mm drivers and a 20 Hz to 20 kHz frequency range. They can be used to deliver a solid performance and effective isolation when monitoring audio for music playback, classroom listening, fitness applications, and more. Featuring a lightweight, over-ear design and wide cushioning on its ear pads, the headphones have an adjustable headband, which provides serious comfort. The low-profile fit makes them ideal for smartphones too. The gray 10-pack of Pearstone 0.5 x 12" Touch Fastener Straps provides a cost-effective way to bundle and organize cables. The straps are easy to use, featuring a loop-through slot and touch fastener attachment. Each tie can be refastened at least 200 times. Box Dimensions (LxWxH) 14.0 x 12.0 x 4.5"
Box Dimensions (LxWxH) 10.15 x 7.55 x 2.55"
Box Dimensions (LxWxH) 15.75 x 4.75 x 1.8"
Box Dimensions (LxWxH) 9.5 x 6.9 x 3.75"
Box Dimensions (LxWxH) 6.5 x 3.8 x 0.9"